Posted on February 16, 2016 in Community by Emily E. Steck. Hasn’t everyone told you? Freelance writers need websites. But what kind of website works best for a freelance profession? And where should you start? We’ve detailed—ad nauseam—the pros and cons of the two types of websites writers use—cover pages and websites—plus a few website builders so that you can finally decide on what kind of freelance website you should build. Here’s your very own detailed guide to creating your freelance writer website. There are two main types of websites for writers: a cover page and a professional website. When we say “cover page,” we are describing one-page websites. The best cover page websites are simple and uncluttered. Cover pages draw a visitor’s attention to a simple idea you want to express in one centralized location. Cover pages are perfect for people who want to express themselves online without building a large web infrastructure. For professionals who often lack the resources, skills and/or money to create a full website, cover pages don’t need too much bandwidth to get their message or offer through to the visitor. Think yoga teachers, psychologists, musicians, etc. Cover pages are also great tools for professionals looking to centralize their online presence or who want to promote specific projects and initiatives. What’s great about a cover page is that it can act as a stepping stone to build that comprehensive website or simply replace it. A professional website, on the other hand, is much larger and conveys more information. We all know what it looks like: there’s a menu with different pages for visitors to click on. One is labelled “About”; another is labelled “Contact”; maybe one is “Portfolio” or “CV”—you get the idea. Professional websites for your business or your personal brand are a great way to express more information than just a cover page. So what do writers use and how do they use them? Writers tend not to choose a cover page as their sole website. It’s usually not enough to show your presence online and, after all, a one-page website worth of copy will probably not impress any potential clients. Worse, a cover page website that redirects users to a portfolio or website can be frustrating. It’s unnecessary clicking. That’s not to say writers can’t and shouldn’t use cover pages. They just should not be used as a supplement to redirect visitors to a portfolio or website. Instead, cover pages are vehicles for side projects that need their own site. Maybe it’s to back your Kickstarter or subscribe to your newsletter or view your resume or buy your book—whatever it is, cover pages are essentially landing pages for your other projects. To show all of your writing services, portfolio pieces, contact information and more, writers choose to create larger websites. If you are a writer or professional in this day and age, you need a website. It’s up to you, though, to determine what’s right for you according to your budget, personal branding, technology expertise and, most importantly, need for a website. A good tip to selecting a web builder and host service: consider which one plays best to your strengths and weaknesses. For example, if you’re great at web design and have strong personal branding, you should create your own website and build the code. If you’re terrible at it, consider purchasing a theme via WordPress or build a website with a service that offers customizable templates. It’d be impossible to cover all of the sites out there that can help you build your very own freelance writer website in a single post. Instead, we’ve compiled the ones we’ve used over the years and reviewed them based on the following necessary criteria: features, customer support, mobile optimization, design and price. P.S. Did you know that websites are a deductible business expense? So try not to worry too much about any impending costs. 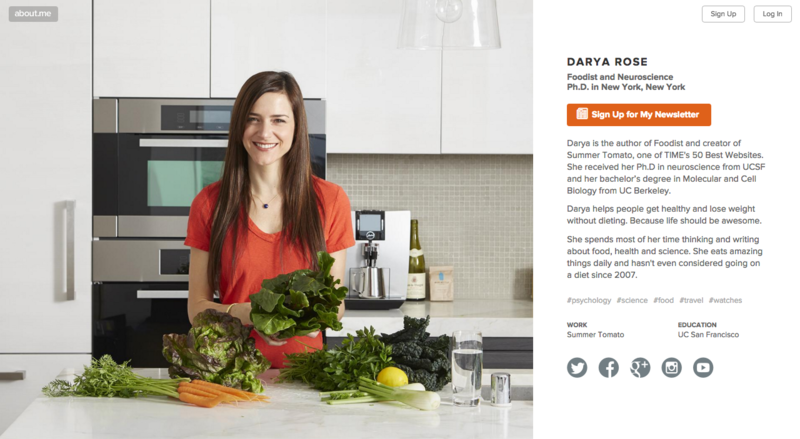 About.me is the ultimate bang-for-your-buck cover page. It’s equipped for directing visitors to check out X and Y, like to ‘Back my Kickstarter’ or ‘Subscribe to my newsletter’. You can add your name, bio, photo, location, interests, education, occupation and social links easily. You can choose from over thirty Spotlight options, which points people to what matters most to you—like the music you’ve created, your writing samples or your storefront. But know this: there are no options to create multiple pages. It’s a one-and-done kind of deal. With a freemium model, About.me lets you create a page for free. It’s super easy to setup and use as well as incredibly intuitive. Under the free version, there are limitations to what you can do to your cover page, both with design and the lack of a custom domain name. To make your page pop, find a really beautiful photo. If you do decide to go pro, you’ll get access to custom photos and patterns, custom fonts, apps and featured content, stats and custom directories. As a premium user, you can also cut to the front of the line with any support or help request. Upgrading to premium costs $4 a month ($48 annually). This package includes a custom domain name (yourname.me), Google Analytics and the option to remove all About.me branding for a cleaner look. Bottom line: If you need a simple cover page that expresses your niche project or just a landing page for your online presence, About.me is a great, affordable option. Squarespace allows you to create anything from cover pages to websites to online e-commerce marketplaces. Be warned: there is no freemium version, just a free trial. Let’s go over the cover page first. For $5 a month ($60 annually), you receive unlimited bandwidth and storage, a mobile-optimized website and a free custom domain name (with an annual purchase). 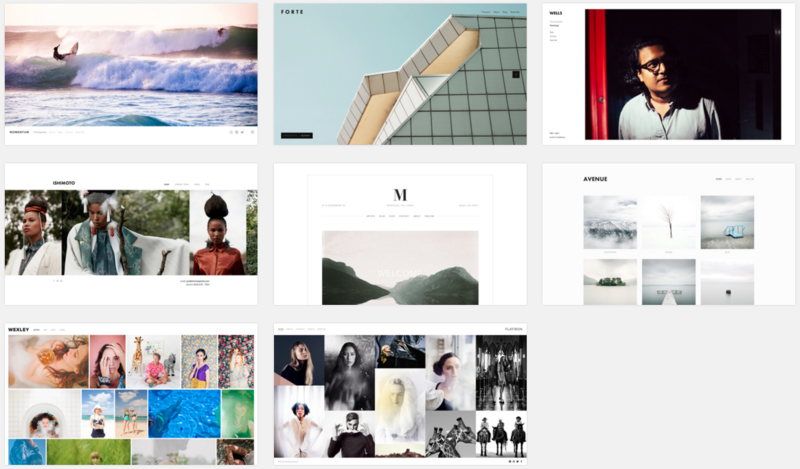 Unlike About.me, Squarespace only offers six types of cover pages: landing page, profile, social, audio, video and map. It’s more general than About.me’s cover page options—there are no options to ‘Back My Kickstarter’ for example—but Squarespace makes up for this in its customizability. With their templates, you can create a gorgeous cover page that’s unique to your personal brand. For larger websites, Squarespace offers a variety of website packages that are ideal for writers who are not tech-savvy. If you aren’t interested in learning code or don’t have the time to learn it, Squarespace is an easy way to build a site. With drag and drop functions, you can put text, images and more wherever you want on the page, all without touching a line of code. Choose from 28 templates to create a snazzy website that’s mobile-responsive. The best package for writers is the Personal website, which costs $8 a month ($96 a year). It includes design capability and cloud-based web hosting as well as customer service. What’s more, Squarespace offers a free domain name for the first year (afterward, it’s $20 a year tacked on). If you already have a domain name, it’s easy to transfer to Squarespace. Whether you pick a cover page or a website, Squarespace provides 24/7 customer service to help you fix any bugs and answer any questions you have. They control, monitor and test every function on your site and manage all performance and security updates for you. They also have plenty of video and text tutorials you can browse through. However, the site does come with drawbacks. For one, it’s not an open-source platform, meaning it may be difficult to integrate non-Squarespace approved tools into the site. Any plugins you’d like to experiment with could be useless with the platform. Bottom line: If you are a tech-novice and value time more than flexibility and price, Squarespace is right for you. Wix is a what-you-see-is-what-you-get website builder. It’s ideal for writers who are less-than-tech-savvy and remains one of the top website builder sites around. With over 500 professional looking templates for you to choose from, all you have to do is plug your information into Wix’s templates. Wix is an all-inclusive service and hosts your website for one set price. The most enticing thing about Wix is how mobile-friendly it is to design. Since Wix’s templates are not mobile responsive on their own, it offers a unique mobile editor. Essentially, you can edit the mobile version of your site separately from the desktop version of your site. Additionally, Wix’s mobile websites come equipped with a Mobile Action Bar feature, which is a small bar at the bottom of your mobile site display with links to email, call, locate your address on a map or see your social network profiles. The biggest pain is switching from design templates. Once you pick and use a template, you won’t be able to change templates without having to input your content again. Additionally, Wix does not allow you access to edit the HTML or CSS codes. However, it does have an impressive app marketplace where you can purchase apps that function like plugins for your site if you want to add more functions. Wix also offers you email and phone support; call them anytime between 6 am to 5 pm PST, or schedule a time for a Wix specialist to call you back. They have help buttons all around the website builder with written, image and video tutorials. Wix even controls all performance and security updates so you don’t have to. Like other website builders, Wix has plenty of pricing options. The best one for writers is probably the Unlimited plan for freelancers at $6.49 a month if you’re keeping a blog and/or want to stay professional. It includes one free year of a domain name, 10G of storage, unlimited bandwidth, free hosting and removal of Wix mobile and desktop ads. Bottom line: If you are less than tech-savvy and want to choose from hundreds of website templates, Wix is an affordable option. Tumblr is a popular microblogging system and social networking website that doubles as an inexpensive place to build your website. Setting up your website with Tumblr is relatively easy and you can start posting in minutes, especially if you have some tech skills and/or familiarity with the platform. Best of all, it’s flexible. 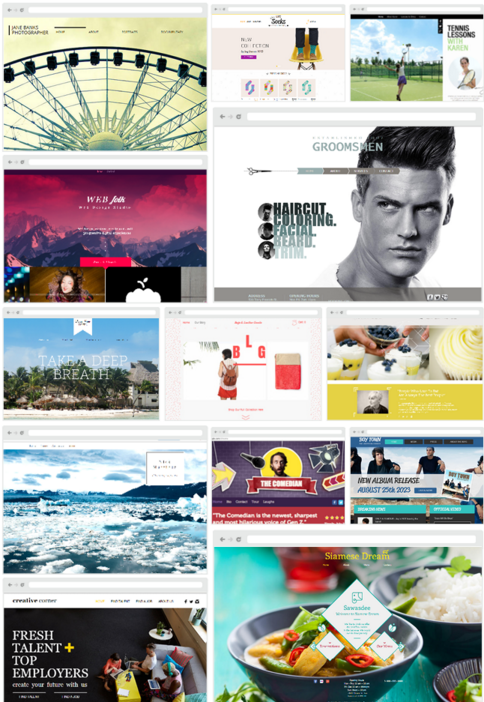 You can scour through free and premium themes, ranging from $9-49, or build one of your own. The sites are optimized for mobile. It’s somewhat customizable in that you can modify themes and add widgets if you know code or the platform well enough. Best of all, you can transfer a purchased domain name over to Tumblr. Your only expense for setting up your site with Tumblr is purchasing the domain name elsewhere, which costs about $10-15 a year. The double-edge sword of Tumblr is that it hosts your site for free. The downside of that is that when Tumblr goes down, your site goes down; it’s up to Tumblr to get it back up again. Because you are “renting” Tumblr to host your site for free as opposed to “owning” your site on a platform like WordPress, customer service isn’t personalized. Worse, if Tumblr makes updates to its platforms, your theme may be incompatible with it and you’ll have to search and/or buy one again. Tumblr is more a content curation platform, not content creation. 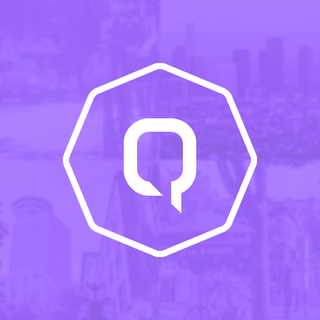 Though it’s made steps to become less weird, it’s still not a longform writing platform. It’s used by many writers as a distribution platform to promote their own work that is hosted elsewhere. However, if you use Tumblr as your main site, it’s easy for other people on Tumblr to find you, follow you and like or reblog your posts via the platform. Bottom line: Tumblr is an inexpensive solution to building and hosting your site but has limitations thanks to being a microblogging platform. WordPress.org is an open-source platform where you can customize your website design however you want. With greater flexibility comes greater responsibility, however. The à la carte options for website building come with a catch: you’re the one doing the legwork. That means creating a design from scratch (with code) or purchasing a WordPress design on the web, as well as purchasing your domain name and a web hosting service. This is not for the tech-averse or writers not willing to learn WordPress. Navigating WordPress can come with a steep learning curve. You will need to know some code to use it. Unlike other website builders, there’s no 24-hour customer support. Instead, you can search through thousands of forums that address your issues. 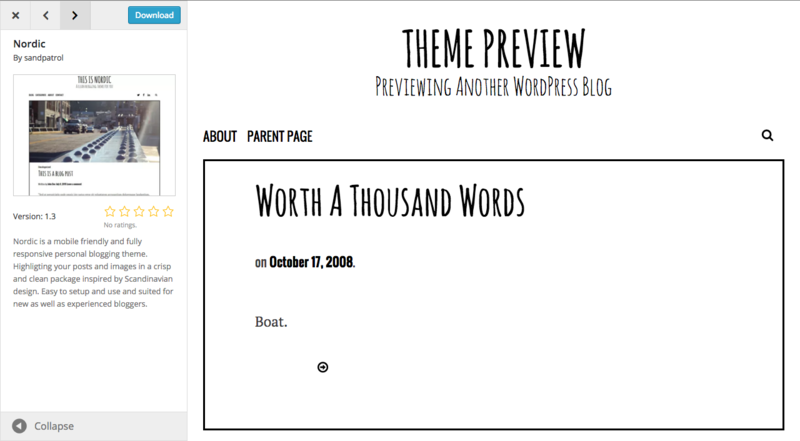 What’s great about WordPress is that it’s a very powerful platform. Of course, if you’re a writer, you are probably familiar with WordPress’ CMS capabilities, so that helps. Not to mention that thousands of free plugins exist so you can add more functions to your WordPress site. It’s pretty easy to update the platform to fix bugs and improve security (provided your theme has been updated). The biggest concern you should have when using WordPress is whether or not you are up to the task of juggling the various costs of using the site. Premium themes (though there are plenty of free themes you can modify and use well), can cost anywhere between $30 to $100 at a flat rate. Alternatively, you can buy a subscription to a WordPress theme archive where you can download as many themes as you’d like. You also have to buy a domain name from somewhere like Namecheap, which costs $10-15 a year. (Pro tip: buy your domain name for as many years as you possibly can; it’s cheaper). You‘ll have to find your own hosting services, which varies in price. Bluehost runs deals for the first year, but after that, the price increases to about $7 per month. Not to mention, there are premium plugins you may use that can cost money. Bottom line: If you want more flexibility, plan on making the most of the platform’s powerful features and are tech-savvy, WordPress will impress. Just be ready to pay for quality. And finally—finally, we promise—a note about portfolios. Writers need websites; they also need portfolios of work. You may find that early in your career you just need a portfolio until you can build up writing services and referrals you’d advertise on your website. 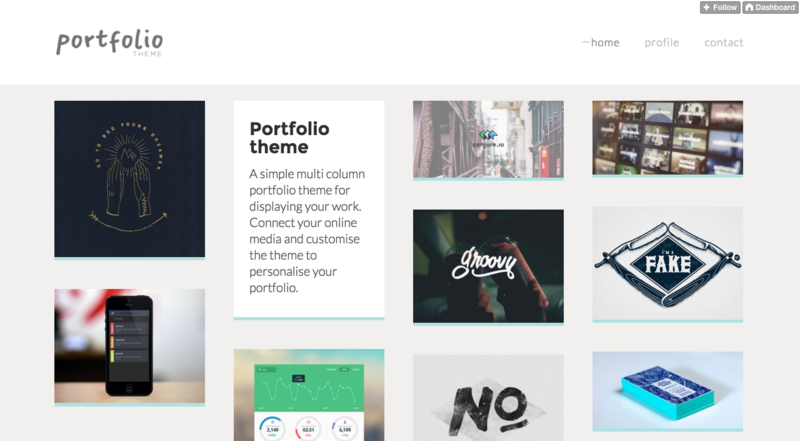 Until then, if you’re looking for something a little more simple, check out our favourite writing portfolio builders.